I remember how surprised I was the first time I saw you. We were in the living room of my parent’s home. We heard the sounds of someone coming down. We turned around and it was you, with a smile so bright, so full of life. It wasn’t until later that I found out that the smile was hiding a deeper sorrow, a heartache caused by a breakup. But by then, I already had fallen hard for you, and you, unknowingly or not, shattered my heart in return. I am in my room, sitting on my bed, with a book in my hand, probably a Murakami. A few days before Christmas, it is cold, but the house is alive, with all its family members back, filled with excitement of hosting new guests. I hear steps coming up to my room. It is you. You ask if you can come in. You ask if you can borrow a book from me. Surprised, but pleasantly so, we start talking. We sit down on the thick carpet of my floor, lean against my bed, and before I know it, we are talking about all the important things in life that people talk about when they first get to know each other – with an understated tension, but a spark of unanticipated excitement. At some point, you fall asleep in my lap. I am frozen. “Does she like me?” “What does this mean?” “What do I do?” “What am I supposed to do?”. I decide to gently lift and hold you in my arms, carry you to my bed and cover you with a blanket. I look at your face for a long time, serene but so fragile. In amazement of this small miracle. Afraid you will wake up, because I don’t want this moment to end. My finger tracing your neck, thinking I discovered the secret of life. I sit on my bed, next to your side, and guard you, until I forget time. Hours later, you are up and we are sitting on my bed – a comfortable silence and conversation, deep in the night. And then, there is the blackout. “This can’t be for real”. Sensible as you are, you suggest to look for candles. I go down and come back, you light them. A faint and soft glow envelops the room. We continue our talk, and at some point I mention to you that I don’t know how to tie a tie. You tell me how you used to help your grandpa on Sunday. You look up and ask me if I have a tie, and I hand you one. You get up and sit close behind me. You slowly wrap your arms around me, softly whisper in my ear, gently show and teach me, how to tie a tie. Days later, and you left. 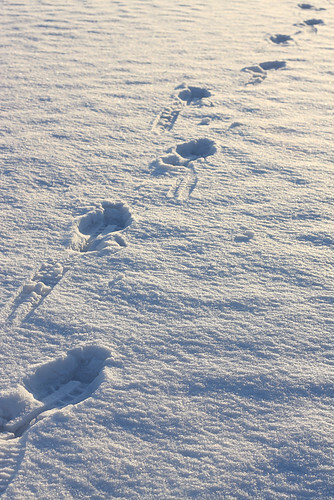 Snow fell the day after, as if to erase the footprints in my memories. Faintly, I still hear you knocking on my door, asking if you can come in. As if snow was falling in April. je zit daar wel mooie en lieve dingetjes te schrijven in je donkere grot. ha ha ha.